Roger and Gail Kiesling purchased an AirMedCare Network membership in May 2017, never thinking they would ever use it. Less than three months later, Roger suffered a cardiac event while he and his wife were driving through Steelville, Missouri – a town of just over 1600. Gail dialed 9-1-1 and Steelville Ambulance responded quickly. The crew pulled Roger from the truck and began treating him in the ambulance. 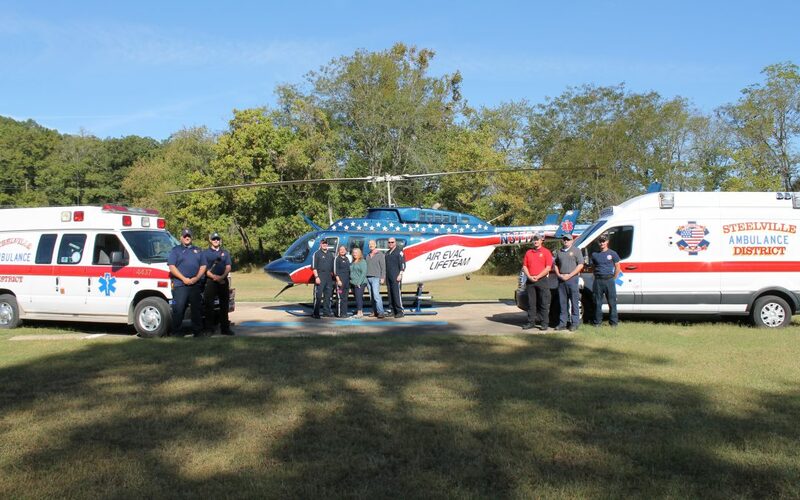 They called for Air Evac Lifeteam out of Sullivan, Missouri, knowing minutes matter when it comes to cardiac issues. Roger lost his heartbeat four different times that day. The Sullivan Air Evac crew transported Roger to SSM Health St. Clare Hospital in Fenton, Missouri, where he remained for nine days. The team at St. Clare put an automatic defibrillator in Roger and monitored it. While he said he moves a little slower than he used to, the 73 year-old feels much better.